JCPenney wanted a shopping companion app in the vein of Target's Cartwheel app. On top of exclusive savings through the app, users would compete against one another for additional discounts and badges. An video developed explaining TAPAS, an internal initiative to shore up communication lines between manufacturing and other team members and facilities. Solely responsible for the direction of the video, I both designed and animated all assets. Developed in English, the video was eventually re-translated into Japanese. AccuWeather is an award-winning weather service that prides itself on the details of forecasting. These principles hold true to the Android app as well and, in my opinion, to a fault. 1. Make content more accessible to users. 3. Design an app I would buy. The approach was to give the majority of users much of the information they might need directly from the homescreen without ever having to go deeper into the app. For those who do want a more detailed forecast, charting has been revamped significantly, providing users with interactive forecasting graphs and MyAccuweather charts rather than the 24-hour snapshot as it exists today. Currently news, video, and maps are all separate sections within the app. However, I believe these all fall under the umbrella of staying informed (apart from forecasting), so I combined them into the same section without sacrificing content. This content can be sorted either regionally or nationally to suit a users preference. Finally, in it's current state, the current app is a gesture-based chore, asking users to swipe back and forth, menu-to-menu through seven separate sections. I wanted to include a navigation that could take you anywhere in the app from anywhere in the app with a simple touch, so I employed a one-touch, lock ring-like thumb menu in the top right that can be accessed any time. It's also extremely useful for one-handed operation. The goal was to make a media kit that stood out from the conservation of the standard Autodesk look. There were multiple iterations in terms of color exploration, but I ultimately decided on black on yellow as a main scheme since the pop of yellow was much more visually arresting than other options, and it worked within the context of the brand vision. Interior pages were given a bolder, infographic motif to communicate data rather than walls of copy. Bold colors were also utilized here as well. For the NWEA mission booklet, I thought it was important for to follow existing brand standards while keeping it easy-to-read despite the copious amount of copy. Main points of the NWEA goals are displayed prominently on section openers (denoted with colors) opposite the finer points and graphs directly related to the section. Lifestyle images focusing on science, math, and technology are used throughout to further convey the message. In developing a retail brand presence for NCH Software – including retail packaging of several of their best-selling offerings – I decided to develop something cleaner and more modern than a typical software box, utilizing white space and an overall clean look while still tailoring each individual product with it's own photography and messaging. In addition to the initial retail packaging, there was also accompanying collateral such as end cap displays, direct mail, CD sleeves, and trade show banners. The AP Press Kit empowers teachers with information on why and how to talk to their students about Advanced Placement, encouraging them to enroll, and ultimately getting those students to take the SAT/PSAT. The folder contained an introductory letter, two brochures, and a 4-panel quick reference for teachers. Navy recruitment ad targeted at graduating high school seniors who have yet to decide on a career path and/or are turning to the military as a potential future option. To celebrate their 30th anniversary, LMC Magazine completely refreshed their look. I had the privilege of branding their anniversary badge as well as assisting in refreshing their old look. Much like the accompanying media kit, the goal in refreshing the Autodesk Seek website to make it stand out from the conservation of the standard Autodesk look while keeping navigation easy to understand and visually appealing. The design mimics the design of the media kit companion, while employing 3D CAD renders that are indicative of the offerings of Autodesk Seek. Online education portal e2020 was completely refreshed, front-to-back. This included a refreshing of (though not redesigning) the logo, gutting their website, and a new brand standard manual companion. While the logo didn't change much in terms of typography – the Eurostile and Myriad font treatments remained – I designed a simple new mark for their overall identity. In addition, the website echos the visual cues of the new brand manual: word bubble headline containers, bright colors, and minimalistic lifestyle photos with a focus on online connectivity. Goldstar, curators of the performance data web app Mastery Manager, wanted a visual rebranding of their current site. Adhering to their initial comments of wanting something cleaner and easy-to-understand, I also took visual cues from their current color palette where I could and implemented them in the various graphic elements throughout the site. A bigger challenge was less on interface design and more with how to implement lots of content in a manageable way. To accomplish this, I relied on rotating marketing boxes, sliders, and branching drop-down menus. Initial concept of the site refresh for Rainbow Publishing. My goal was to use a darker theme in order to make the content more prominent in relation to the elements surrounding them. I chose complementary colors to raise contrast even further. The challenge in redesigning the Shell Education website was deciding how to mitigate varying degrees of content, but in the realm of an e-commerce platform. The use of color was used to great effect in visually differentiating between content throughout the site. UI/UX exploration done for the Winter Group developed app, Schedulr. The goal was to keep the UI friendly, gender-neutral, and most importantly, (given the target audience), both easy to navigate and understand. While the interface went in a different direction visually, the UI principles remained the same despite the visual treatment. With the launch of their internet monitoring software, NCH Software commissioned me to create an infographic that conveyed the average time wasted online in a normal workspace. Personal feelings aside, it's friendly in it's execution given the subject matter it portrays. A variety of logos for an equally varied range of clients. A personal piece highlighting both the Russian space program and my profound love of Russian, cold war-era propaganda. A project I've wanted to tackle for a while, this Transformers exploration gave me an opportunity to experiment with both flat color and an angular, polygonal art style, the latter of which I've always wanted to try. Initially it was just going to be two heads – Optimus Prime and Megatron – but I was enjoying it so much that the number kept growing. I ultimately stopped at 14, highlighting my 14 favorite (or important) Autobots and Decepticons from the Transformers universe. I may come back to this in the future and add more. 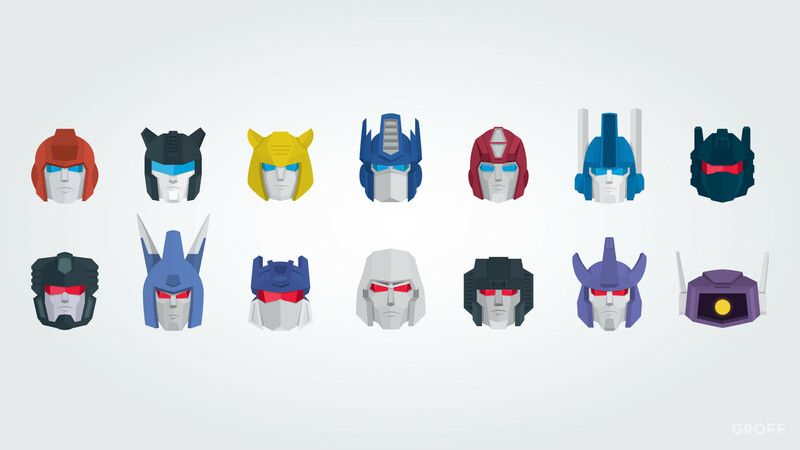 My end goal is to print it (pricey at 36"x13.5"...) and create wallpaper packs for each head and group, so check back! In the meantime, here's a collected 2560x1440 wallpaper. In keeping with my interest of space, ancient structures, and the equally interesting work of Christopher Dunn, I created a minimalist study in a salute to the Giza Powerplant theory. A one sheet created for the (formerly) annual Manor Halloween party in the Capitol Hill district of Denver, Colorado. I wanted to use a cartoonish, stark image that evoked John Kricfalusi's work (ie. Mighty Mouse, Ren and Stimpy, etc.) and I feel like I accomplished that with the silhouette of the hand and the house backlit by the moon. Drawing on nerd influences and my unabashed love for gaming, I decided to make a personal piece for my media room that drew heavily from the original one sheet of Fritz Lang’s “Metropolis”. This was the result. WearScience and I joined forces to create a short advertisement for their line of "Controversy" t-shirts. The themes touched on in the video – from the Illuminati to the hollow Earth – are all themed t-shirts available from their store. I'm pleased with how clean the piece turned out on the animation end. The Local Spot was to be a hybird of YouTube and the Yellow Pages...think a local directory with video. I was commissioned to make this piece to highlight how the service worked and how it could work for potential customers. In addition to all animation, this highlight video was my first real crack at directing on-screen talent, as well as color keying in post with animation on top. Notwithstanding the animation, for that reason, this piece holds a special place in my professional development. A looping intro video that played in the entrance hall at the 2011 AEP Awards. Additionally, there were bumpers and banners that went along with every award given. All told, around 20 separate print and video companions made for the event. Introduction bumper for National Cinemedia’s FirstLook programming when paired with Fathom Events, a live, in-theater concert or event series. Mitsubishi, attempting to make waves in the television industry, began employing a 6-color chip that included magenta, giving a deeper, more vibrant color palette to LCD televisions. Because Mitsubishi Electric televisions aren't as common as other import brands, I decided to employ an invasion theme across three spots, each with it's own individual identity and style that mimics the time period portrayed, while still highlighting their new 6-color technology. At the time of this creation, not much was known about the (then) Nintendo Revolution other than it's front blue LED and that it would play a library of classic games. With that in mind, I created animated, stroked pixel versions of NES assets from the classic games they depict and coupled them with matching sounds and music to convey a retro, CRT tube, arcade feel. As every line stroke was sourced from the original asset and then animated frame-by-frame, this remains the project in which I put the most time in to. If there is such a thing as a "labor of love", this was certainly it.